I was one of the guys from Stacken that made the trip to HAL2001 to participate in that major event. One of our goals was to have with us computer equipment like noone else. As we did not se anyone else with an OpenVMS cluster, we probably met our goal. This is the cluster as it looked like during HAL2001. Now it has moved indors again but still serves this page. The penguin is a generic german Autobahn Rasthof Pinguin (cluster) which was feeling lonely between violet elephants and other animals that would be quite scary to meet on the Autobahn. The penguin has for obvious reasons been named ARP(c). 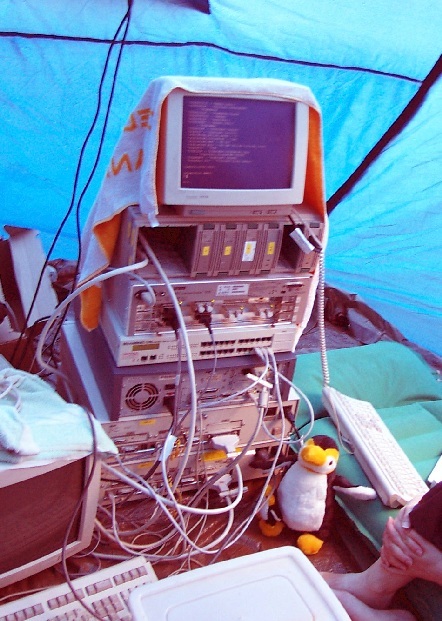 During the time at HAL2001, the system crashed two times, probably because of some DoS attack. Net and 220V availability at HAL2001 was good. The script kiddie spoofing ARP entries for the default gateway was sucessfully defeated by defining a static arp entry for the correct MAC addr. And the pub flag helped other people, too. One of the good things with a tent clustrer is that it acts as built in heating and towel dryer.